Crofts Estate Agents are pleased to bring to the market this sizeable detached bungalow located in the heart of Immingham. With off road parking to the front of the house on both sides of the garden plus the use of a garage. Internally, there are many different layout options to make this house work for you. With an addition of a partition wall this could be made into a four bedroom property as there has previously been a wall removed in the rear lounge. 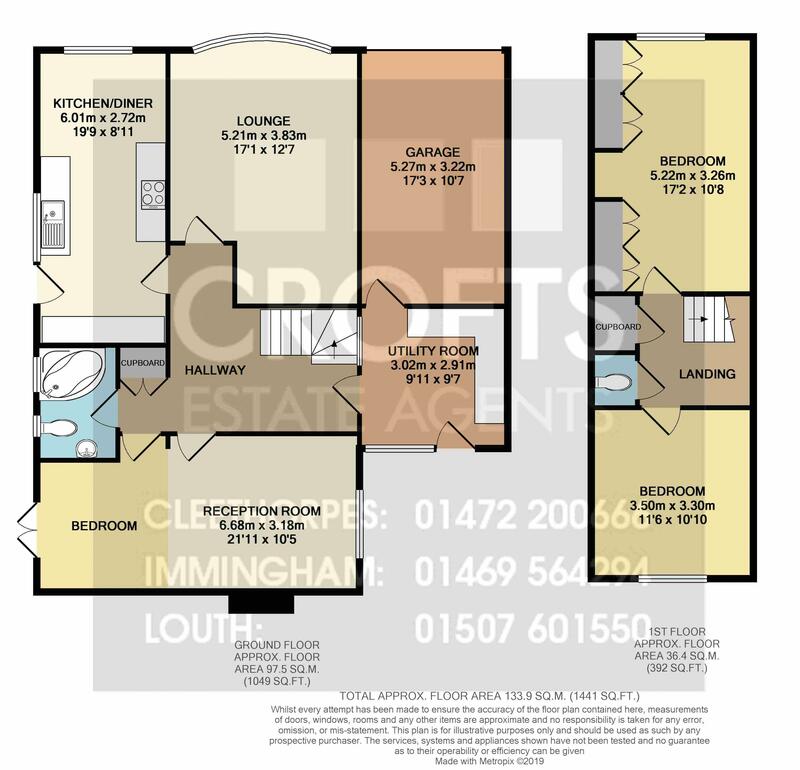 The ground floor layout comprises of a kitchen diner, bathroom, front lounge, hallway, second kitchen/utility and a rear reception room with double doors onto the back garden. The first floor has a W/C and two double bedrooms. The rear garden has a large shed and a lawned section running along the back of the house, which then meets the driveway which runs down the side of the house. Viewings are available immediately so contact our Immingham branch to arrange yours. The kitchen diner is located to the front of the property and is accessed via the side door off the driveway. The kitchen has units along three walls which provides a nice amount of storage space. The dining area of the room is located just in front of the front uPVC window which makes it a nice position to look out at the front garden. The lounge is located to the front of the property and is a really good sized reception room. The room could be utilised as a good sized double bedroom should you wish to have just one reception room. Neutrally decorated plastered walls and a curved front bay window. The bathroom is located off the main hallway and provides the house with a three piece suite which includes a toilet, wash basin and corner bath with shower over. The Biasi boiler is located in this room. Previously two rooms, it has now been knocked through into this large open plan reception area. To the front there is a uPVC window and to the opposite end of the room there are a set of double patio doors. The current vendors have built a large external chimney which houses the log burner which is a major feature of this room. This room is located to the rear of the bungalow and has a door which opens onto the back garden. There is also a door from this room which opens into the garage. There are a range of wall and base units in this space and a hob/cooker, however there isnt any water or plumbings so that will need to be installed to have washing machines and dishwashers etc added. The first of the first floor bedrooms is a large double bedroom which benefits from having fitted wardrobes along the left hand wall, this creates brilliant storage space. There is a front uPVC window which brings in light into room. The second of the first floor bedrooms is another double in size and faces out onto the back garden. Neutrally decorated throughout with a rear uPVC window. Located off the landing area, the vendors have installed this W/C which is ideal and is stops the need for coming down to the ground floor bathroom.